I teach about violence. As I left “the life” I discovered that my niche wasn’t so much teaching cops as I had expected, or even teaching civilian self-defense. 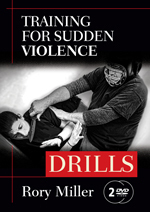 The material seemed to resonate most with experienced martial artists who were coming to discover how little they really knew about violence. I teach about violence. As I left "the life" I discovered that my niche wasn't so much teaching cops as I had expected, or even teaching civilian self-defense. The material seemed to resonate most with experienced martial artists who were coming to discover how little they really knew about violence. Teaching, especially in martial arts, is often hierarchical. There is a clear sense of who is above and who is below. Information flows down, always under control of the instructor. Sometimes it comes with a ritual of dominance and submission: some students bow to a master. It's not that criminals are somehow magically better fighters than people who train and stay in shape. It is that criminals will go to a place inside themselves that your instructor will not, a place that too many people cannot even imagine. So what follows are drills and exercises. Things that I think are important for observation, for integrating mind/body and for efficient motion. Stuff like that. Some involve motion, because anything that escalates to a physical fight is a matter of motion. Many involve mindset, because most of the catastrophic failures I have seen in a fight have been mental, not physical. Almost all, at some level, are about accurately seeing the world. I believe there are three things that you must master to successfully defend yourself: awareness, initiative and permission. Awareness is as broad and deep or as narrow and focused as you can handle it. From seeing in an instant the position and momentum of an attacker and each part of the attacker to seeing the dynamic of a room or a street, awareness goes as far as you have the discipline and curiosity to take it. It must be an informed awareness, however. Seeing everything is not the same as understanding everything. You may notice three young men suddenly going silent and separating, but if you do not recognize what that means, the information is useless. Initiative is the ability to act decisively and ruthlessly. Simply to act. Simply to move. Make a decision, execute. People hesitate. They make a decision and they question it. They decide to move and then they prepare to move and set to move. All of these hesitations are visible and take time. They make you an easier victim. Permission is the ability to do what you have decided to do. 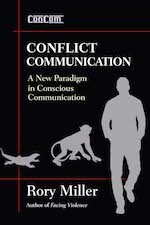 You have an entire lifetime of social conditioning telling you what conflict is and how to deal with it. When the type of violence you are facing is different from the social conflict you have been prepared for, the social responses will not work. Not only do violent criminals know this, they count on it. You must give yourself permission to break the rules, and to do that you must know what the rules are. There are also four elements in any conflict: You, the threat or threats (bad guys), the environment, and luck. Most martial arts are centered on you: teaching you to move, to punch, kick, pin and throw. Further, much of the training focuses on the physical self and at best pays lip- service to the ethical, spiritual, emotional and intellectual aspects. You have a brain and a spirit that must be explored and trained. All three (mind, body, spirit) are potential points of failure. You must emphasize the strengths and know the weaknesses. There is also a bad guy in a fight (or many) and you must understand him. If he is a predator, he is there neither to test you nor to help you develop skills. He is there to take something from you and do it as safely and efficiently as possible. To let you know anything in advance or to feed you the type of attacks you have trained against would be stupid. Do not count on the threat being stupid. You should know, as much as possible, how threats think and feel and plan as well as how all humans move and how they break. Fights happen in places. Often, training is set up to minimize the variables of environment so that specific skills can be trained and tested. It is fine as long as you understand the depth of the limitation. You will fight in a world of infinite hazards and opportunities. The one who is better at seeing and exploiting these has a huge edge in the real world. Lastly is luck. Professionals work to take luck out of any planned operations and dojo are kept clean and uncluttered to try to minimize chaos. Chaos is the natural environment of a fight. Stuff happens. Things you don't see, like slippery surfaces or a table behind you, can have a profound effect on the outcome. Managing chaos, the use and mitigation of luck is a skill as well, a skill centered on awareness of possibility or hazard and ruthless exploitation (e.g. initiative) of those elements. Fighting is inherently conservative and this shows in martial arts. Fighting is dangerous. People get hurt and killed. For everything that might work there are a hundred things that seem like a good idea that can lead to a messy death. We have kata and tradition NOT because people are stuck in tradition but because when people consistently survived it was considered imperative to remember how and model it. A lot has been lost in translation and by transmission over time, but most of the systems that survived have the bones. But that may not be enough. They also were built around specific individuals in specific times and places. I have no interest in teaching you to do what I do. You aren't me. We have different bodies and different minds. Imitate an instructor and the best you can ever hope for is to become a flawed clone of someone else. But work on you, and you can become better than your teacher. Not the same, better. The key is to become the most efficient "you" that you can be. If you ever need these skills, I won't be there. Neither will your sensei or your mommy. Whatever saves your life must come from inside . . . so start working on your insides. The physical skills of self-defense are easy. It is not that hard to kill or cripple a human being. Knowing when such force is appropriate and necessary, recognizing danger and summoning the will to cross that line—those are rarely taught and absolutely critical. The baseline of self-defense has almost no relationship to the baseline for martial arts, however. Let's start with one, very simple thing—power generation. A traditional martial artist is taught how to hit hard. Different systems have different methods of power generation, but two of the most common involve a solid connection with the ground and good structure. The solid connection with the ground allows you to put the power of your legs into a punch. Good structure keeps that power from being lost or bled off into space by excessive motion. You can add more to it, whipping action with the hips and rotational power transmitted through the spine . . . doesn't matter. If you've been training for any length of time, you should have been taught how to hit hard. Here's where it gets ugly. You get surprised. "Not me! I have good situational awareness!" Get over that. Assuming: 1) There is an experienced bad guy in the picture, and 2) you aren't creating a situation yourself— you will be surprised. If the bad guy can't get surprise, he'll go hit someone else. Got that? If you aren't surprised, you don't get to use your skills. You are surprised. It's not like the timing in sparring, with the closing distance and maintaining defense and some feints for you to read and interpret. Nope. The bad guy got close, got you distracted for a second and hit you. Not the one-half-power-hit- and-judge-for-effect that most inexperienced people do. Nope, it's a flurry attack, so many things coming at your face and body so fast that your mind freezes. Crunching noises and pain coming from your face, your belly collapses with a blow, and you can't breathe and you're shoved, bent over into a wall with more hits coming in. This is the natural environment of a sudden assault and if you don't have an answer for this situation, you don't have an answer at all. That's just one example, but everything else in self-defense, the timing, distance, speed, strategy, targeting are all vastly different from the assumptions of sparring. What you can do with in your own weight class is irrelevant to self-defense skills. This is the baseline. This is what I train for. 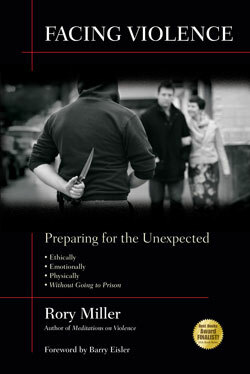 The above has been adapted from the "Introduction" from Training for Violence: 72 Practical Drills by Rory Miller, author of Facing Violence.